Millions of metric tons of plastics are produced annually and transported from land to the oceans. Finding the fate of the plastic debris will help define the impacts of plastic pollution in the ocean. Here, we report the abundances of microplastic in the deepest part of the world’s ocean. We found that microplastic abundances in hadal bottom waters range from 2.06 to 13.51 pieces per litre, several times higher than those in open ocean subsurface water. Moreover, microplastic abundances in hadal sediments of the Mariana Trench vary from 200 to 2200 pieces per litre, distinctly higher than those in most deep sea sediments. These results suggest that manmade plastics have contaminated the most remote and deepest places on the planet. The hadal zone is likely one of the largest sinks for microplastic debris on Earth, with unknown but potentially damaging impacts on this fragile ecosystem. Hammer, J., Kraak, M.H.S., Parsons, J.R. (2012) Plastics in the marine environment: the dark side of a modern gift. In: Whitacre, D. (Ed.) Reviews of Environmental Contamination and Toxicology. Reviews of Environmental Contamination and Toxicology (Continuation of Residue Reviews), volume 220. Springer, New York, 1-44. Cózar, A., Echevarría, F., González-Gordillo, J.I., Irigoien, X., Úbeda, B., Hernández-León, S., Palma, A.T., Navarro, S., García-de-Lomas, J., Ruiz, A., Fernández-de-Puelles, M.L., Duarte, C.M. (2014) Plastic debris in the open ocean. Proceedings of the National Academy of Sciences 111, 10239-10244. Ivar do Sul, J.A., Costa, M.F. (2014) The present and future of microplastic pollution in the marine environment. Environmental Pollution 185, 352-364. Jambeck, J.R., Geyer, R., Wilcox, C., Siegler, T.R., Perryman, M., Andrady, A., Narayan, R., Law, K.L. (2015) Plastic waste inputs from land into the ocean. Science 347, 768-771. Geyer, R., Jambeck, J.R., Law, K.L. (2017) Production, use, and fate of all plastics ever made. Science Advances 3, doi: 10.1126/sciadv.1700782. Thompson, R.C., Olsen, Y., Mitchell, R.P., Davis, A., Rowland, S.J., John, A.W., Russell, A.E. (2004) Lost at sea: where is all the plastic? Science 304, 838-838. Barnes, D.K., Galgani, F., Thompson, R.C., Barlaz, M. (2009) Accumulation and fragmentation of plastic debris in global environments. Philosophical Transactions of the Royal Society B: Biological Sciences 364, 1985-1998. Van Sebille, E., Wilcox, C., Lebreton, L., Maximenko, N., Hardesty, B.D., Van Franeker, J.A., Eriksen, M., Siegel, D., Galgani, F., Law, K.L. (2015) A global inventory of small floating plastic debris. Environmental Research Letters 10, doi: 10.1088/1748-9326/10/12/124006. Chae, Y., An, Y.J. (2017) Effects of micro-and nanoplastics on aquatic ecosystems: Current research trends and perspectives. Marine Pollution Bulletin 124, 624-632. Oliveira, M., Ribeiro, A., Guilhermino, L. (2012) Effects of exposure to microplastics and PAHs on microalgae Rhodomonas baltica and Tetraselmis chuii. Comparative Biochemistry and Physiology Part A, S19-S20. Arthur, C., Baker, J., Bamford, H. (Eds.) (2009) Proceedings of the International Research Workshop on the Occurrence, Effects and Fate of Microplastic Marine Debris. Sept. 9-11, 2008. NOAA Technical Memorandum NOS-OR&R-30. Hidalgo-Ruz, V., Gutow, L., Thompson, R.C., Thiel, M. (2012) Microplastics in the marine environment: a review of the methods used for identification and quantification. Environmental Science & Technology 46, 3060-3075. ). So far, however, microplastics in the deepest ocean remain largely unexplored. Jamieson, A.J., Fujii, T., Mayor, D.J., Solan, M., Priede, I.G. (2010) Hadal trenches: the ecology of the deepest places on Earth. Trends in Ecology & Evolution 25, 190-197. Jamieson, A.J., Malkocs, T., Piertney, S.B., Fujii, T., Zhang, Z. (2017) Bioaccumulation of persistent organic pollutants in the deepest ocean fauna. Nature Ecology & Evolution 1, doi: 10.1038/s41559-016-0051. Dasgupta, S., Peng, X., Chen, S., Li, J., Du, M., Zhou, Y.-H., Zhong, G., Xu, H., Ta, K. (2018) Toxic anthropogenic pollutants reach the deepest ocean on Earth. Geochemical Perspectives Letters 7, 22-26. Goldstein, M.C. (2012) Abundance and ecological implications of microplastic debris in the North Pacific Subtropical Gyre. Doctoral dissertation, University of California, San Diego. Rios, L.M., Moore, C., Jones, P.R. (2007) Persistent organic pollutants carried by synthetic polymers in the ocean environment. Marine Pollution Bulletin 54, 1230-1237. Andrady, A.L. (2011) Microplastics in the marine environment. Marine Pollution Bulletin 62, 1596-1605. Claessens, M., Meester, S.D., Landuyt, L.V., Clerck, K.D., Janssen, C.R. (2011) Occurrence and distribution of microplastics in marine sediments along the Belgian coast. Marine Pollution Bulletin 62, 2199-2204. Napper, I.E., Thompson, R.C. (2016) Release of synthetic microplastic plastic fibres from domestic washing machines: effects of fabric type and washing conditions. Marine Pollution Bulletin 112, 39-45. Kaiser, J. (2010) The dirt on ocean garbage patches. Science 328, 1506. Tseng, Y.H., Lin, H., Chen, H.C., Thompson, K., Bentsen, M., Böning, C.W., et al. (2016) North and equatorial Pacific Ocean circulation in the core-ii hindcast simulations. Ocean Modelling 104, 143-170. Zarfl, C., Matthies, M. (2010) Are marine plastic particles transport vectors for organic pollutants to the Arctic? Marine Pollution Bulletin 60, 1810-1814. Katija, K., Choy, C.A., Sherlock, R.E., Sherman, A.D., Robison, B.H. (2017) From the surface to the seafloor: How giant larvaceans transport microplastics into the deep sea. Science Advance 3, doi: 10.1126/sciadv.1700715. Oguri, K., Kawamura, K., Sakaguchi, A., Toyofuku, T., Kasaya, T., Murayama, M., Fujikura1, K., Glud, N.R., Kitazato, H. (2013) Hadal disturbance in the Japan Trench induced by the 2011 Tohoku–Oki Earthquake. Scientific Reports 3, doi: 10.1038/srep01915. Glud, R.N., Wenzhöfer, F., Middelboe, M., Oguri, K., Turnewitsch, R., Canfield, D.E., Kitazato, H. (2013) High rates of microbial carbon turnover in sediments in the deepest oceanic trench on Earth. Nature Geoscience 6, 284-288. Itou, M., Matsumura, I., Noriki, S. (2000) A large flux of particulate matter in the deep Japan Trench observed just after the 1994 Sanriku-Oki earthquake. Deep Sea Research Part I: Oceanographic Research Papers 47, 1987-1998. Nunoura, T., Takaki, Y., Hirai, M., Shimamura, S., Makabe, A., Koide, O., Sunamura, M. (2015) Hadal biosphere: insight into the microbial ecosystem in the deepest ocean on Earth. Proceedings of the National Academy of Sciences 112, 1230-1236. Taira, K., Kitagawa, S., Yamashiro, T., Yanagimoto, D. (2004) Deep and bottom currents in the Challenger Deep, Mariana Trench, measured with super-deep current meters. Journal of Oceanography 60, 919-926. Turnewitsch, R., Falahat, S., Stehlikova, J., Oguri, K., Glud, R.N., Middelboe, M., Kitazato, H., Wenzhöfer, F., Ando, K., Fujio, S., Yanagimoto, D. (2014) Recent sediment dynamics in hadal trenches: evidence for the influence of higher frequency (tidal, near-inertial) fluid dynamics. Deep Sea Research Part I: Oceanographic Research Papers 90, 125-138. Cedervall, T., Hansson, L.A., Lard, M., Frohm, B., Linse, S. (2012) Food chain transport of nanoparticles affects behaviour and fat metabolism in fish. Plos One 7, doi: 10.1371/journal.pone.0032254. Rillig, M.C. (2012) Microplastic in terrestrial ecosystems and the soil? Environmental Science & Technology 46, 6453-6454. Mattsson, K., Ekvall, M.T., Hansson, L.A., Linse, S., Malmendal, A., Cedervall, T. (2014) Altered behavior, physiology, and metabolism in fish exposed to polystyrene nanoparticles. Environmental Science & Technology 49, 553-561. Avio, C.G., Gorbi, S., Regoli, F. (2017) Plastics and microplastics in the oceans: From emerging pollutants to emerged threat. Marine Environmental Research 128, 2-11. Wright, S.L., Thompson, R.C., Galloway, T.S. (2013) The physical impacts of microplastics on marine organisms: a review. Environment Pollution 178, 483-492. Kershaw, P.J., Rochman, C.M. (2015) Sources, fate and effects of microplastics in the marine environment: part 2 of a global assessment. Reports and studies-IMO/FAO/Unesco-IOC/WMO/IAEA/UN/UNEP Joint Group of Experts on the Scientific Aspects of Marine Environmental Protection (GESAMP) eng no. 93. Taylor, M. (2017) “Plastics found in stomachs of deepest sea creatures”. The Guardian, 15 November, https://www.theguardian.com/environment/2017/nov/15/plastics-found-in-stomachs-of-deepest-sea-creatures. ). Further work to evaluate the impacts of microplastics on fragile hadal ecosystems is urgently needed in the future. All the synthetic polymers found in this study could be derived from textiles, ropes, fishing gear (nets, lines etc. ), plastic beverage bottles, and packaging materials (Andrady, 2011; Claessens et al., 2011; Napper and Thompson, 2016), while rayon may also be used in personal hygiene products and cigarette filters (Woodall et al., 2014). Except for polypropylene and polyethylene, all the polymer types recorded in this study are negatively buoyant (Andrady et al., 2011) and would eventually sink. Besides the ocean surface (Thompson et al., 2004; Barnes et al., 2009; Van Sebille et al., 2015; Chae and An, 2017), potential sinks for plastics include deep sea biota (Oliveira et al., 2012), the water column (Courtene-Jones et al., 2017; Kanhai et al., 2018) and sediments (Bergmann et al., 2017), where broken plastics exist as microplastics (<5 mm in size) (Arthur et al., 2009; Hidalgo-Ruz et al., 2012). It has been demonstrated that microplastics could be available to every level of the food web (Cedervall et al., 2012; Rillig, 2012; Mattsson et al., 2014; Avio et al., 2017). At 10903 m, the microplastic abundance reaches 11.43 pieces per litre, which is four times higher than that reported in the subsurface water of open seas, including the NE Pacific Ocean (Desforges et al., 2014), South Pacific subtropical gyre (Eriksen et al., 2013), North Pacific Gyre (Goldstein, 2012), North Atlantic Ocean (Courtene-Jones et al., 2017), and the Arctic Ocean (Bergmann et al., 2017; Kanhai et al., 2018) (Table 1). We compared the microplastic abundances of our sediment samples with that in deep sea sediments reported from other studies (Van Cauwenberghe et al., 2013; Woodall et al., 2014; Bergmann et al., 2017) (Table 1). However, it is comparable to Arctic deep sea sediments, where the highest abundance of microplastics recorded was 3463.71 pieces per litre, at a depth of 2783 m (Bergmann et al., 2017). Polyester, followed by acrylic fibres dominate in sediments from the deep NE Atlantic, Mediterranean, and SW Indian Ocean (Woodall et al., 2014), while chlorinated polyethylene, polyamide and polypropylene account for 76 % in Arctic sediments (Bergmann et al., 2017). Plastics are worldwide marine pollutants, accumulating in seawater and sediments (Hammer et al., 2012; Cózar et al., 2014; Ivar do Sul and Costa, 2014). Although it was reported that toxic anthropogenic pollutants (e.g., persistent organic pollutants) have reached the deepest ocean on Earth (Jamieson et al., 2017; Dasgupta et al., 2018), little is known about the nature of anthropogenic microplastics in this deep and remote environment. The high abundance of microplastics in hadal bottom water is also comparable to that reported in coastal waters, for example, in the Yangtze River and the Strait of Georgia, which are regarded as heavily polluted by microplastics (Desforges et al., 2014; Zhao et al., 2014). To evaluate the abundance, distribution, and fate of microplastics in the hadal zone, we collected bottom water samples and sediment samples at depths of 2500-11000 m and 5500-11000 m, respectively, from the southern Mariana Trench, where the Challenger Deep, the deepest point on Earth, is situated (Fujioka et al., 2002) (Fig. 1). It was estimated that between 4.8 and 12.7 million metric tons of plastic waste entered the ocean in 2010 and this mass could increase by one order of magnitude by 2025 (Jambeck et al., 2015; Geyer et al., 2017). 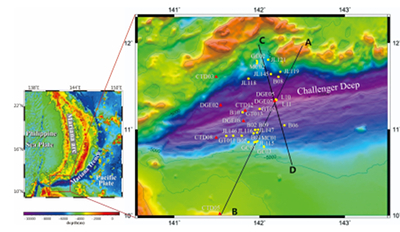 A relatively rapid deposition of sediments has also been reported in the hadal zone of Mariana Trench (Glud et al., 2013), probably due to erratic downslope sediment transport triggered by occasional earthquakes and/or repeated resuspension and deposition of material (Itou et al., 2000), which could result in increased accumulation of microplastics in the hadal zone. The hadal zone, which is the deepest region (6000-11000 m) of the oceans lying within trenches, represents 1-2 % of the global benthic area (Jamieson et al., 2010). The high abundance of microplastics in Mariana bottom water and sediments may be derived from industrialised regions in the Northwest Pacific (Jamieson et al., 2017) and the North Pacific Subtropical Gyre, so called “Great Pacific Garbage Patch” (Kaiser, 2010), where the Pacific surface circulation, i.e. the Eastern Subtropical Mode Water and Subtropical Mode Water, may lead to long distance transport of microplastics to Mariana trench, respectively (Tseng et al., 2016). Colonisation by organisms, adherence to phytoplankton, and aggregation with organic debris and small organic particles will eventually enhance settling (Zarfl and Matthies, 2010; Katija et al., 2017). Ingestion of microplastics may result in adverse health effects, such as internal blockage and endocrine dysfunction (Wright et al., 2013, Kershaw et al., 2015). In addition, the narrow V-shaped topography of the trench may also enhance the downslope flux of microplastics into the hadal zone (Nunoura et al., 2015). It was reported that the vertical transportation rate of surface-derived material can be up to 64-78 m per day in the Japan Trench (Oguri, 2013). For example, polypropylene and polyethylene are most abundant in the water column of the North Pacific Ocean (Rios et al., 2007). Bottom currents, together with propagating internal tides, may further enhance the downwelling of particles and foster the accumulation of microplastics in the Mariana Trench (Taira et al., 2004; Turnewitsch et al., 2014). Recently, microplastics were reported to be found in crustaceans from the deep trenches (A.J. Jamieson in The Guardian newspaper report by Taylor, 2017). The maximum abundance of microplastics detected in the Mariana sediments is twice as high as that reported in deep sea sediments from the Atlantic Ocean and the Mediterranean Sea (70-800 pieces per litre, Woodall et al., 2014), and twenty times more than that in deep sea sediments from the SW Indian Ocean and the Southern Atlantic (Van Cauwenberghe et al., 2013; Woodall et al., 2014).